On May 3, at the Naha Civic Hall, the Okinawa Constitution Promotion Council, the Okinawa Human Rights Association, and the Okinawa branch of the Japan Scientists’ Association jointly held the 2016 Constitution Lecture Event in honor of Japan’s Constitution Day. This event, the fifty-first annual Constitution Lecture Event, was held at a time when Japan’s political situation seems to be heading in the direction of constitutional change. At the event, around 1,500 participants (organizer estimate) pledged to uphold Article 9 of the constitution. Across Okinawa, events promoting both constitutional preservation and constitutional change were held, providing opportunities for many people in Okinawa to consider the constitution. At the Constitution Lecture Event, Genichiro Takahashi, writer and professor in the Faculty of International Studies at Meiji Gakuin University, gave a lecture titled “Democracy: An Unfinished Project.” Professor Takahashi spoke of the importance of not making generalizations, telling the audience that steps forward can only be made with our own feet. 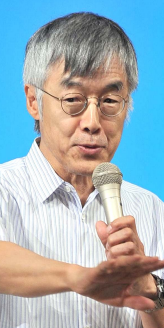 He expressed hope that Okinawans will honor their own unique view of the constitution, one different that of people in other parts of Japan. The event also included a panel discussion featuring Professor Takahashi, Jinshiro Motoyama and Yuri Ishibashi of SEALDs RYUKYU, and Mayumi Shiroma of Mothers Against the Security Laws @Okinawa. The four discussed such topics as society’s views on young people and mothers raising their voices and political activities that can fit into people’s everyday lives. The group Okinawa Performers Choosing to Renounce War also performed a reading on the theme of Article 9 and Okinawa. They called for the repeal of the new security legislation and the cancellation of construction of a new military base in Henoko, Nago.